This quick blog post will hope to give you a heads up in how to work with container(s) disk data. It’s a known fact that container(s) storing data will not persist if the container is removed. Yes! If you build a container to store your data, it will be gone. Containers are perfectly suited for testing, meant to fast deployment of a solution, and can be easily deployed to the cloud. It’s cost effective! Very important to understand! Containers disk data only exist while the container is running. If the container is removed, that data is gone. So, you got to find the way to properly configure your container environment to make the data persist on disk. 1. Create a docker volume. 2. Or, use a local machine folder area. *Note: There are other solution to help with persisting data for containers, but this a good starting point. I’m using the docker command line for now. Later, I will be creating some blog post about using Docker Compose and Kubernetes. 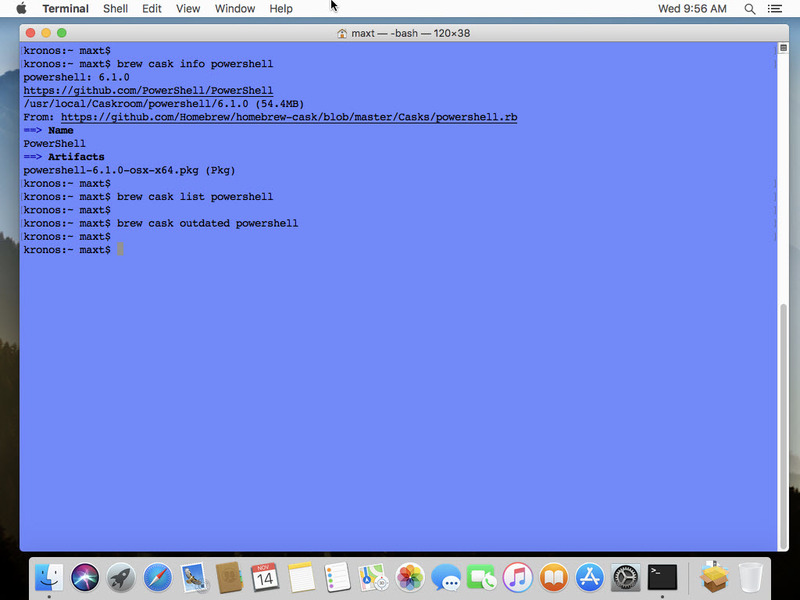 I love to use PowerShell Core with Docker command line! Using docker command “docker volume create <nameofvolume>” will create the volume to help persist data on your local machine. In this case, the mount location is on the Linux box under the Docker Volumes folder. This means all data can persist on you local machine. This option seems straight forward as there’s no need to create a Docker Volume. Just use the ‘-v’ switch in the Docker Run command line. In the following command line I’m activating the Docker container with previously configured Microsoft SQL Server instance. I include the ‘-v’ switch to mount a folder on my local machine. Using “docker exec -i <containerid/name> ls <containerfolderlocation” will display the results of all the files back to the screen. Now, anything you add to that local folder will be accessible to the container. This is a good starting point when learning how to work with Docker data in containers. You’ll still go thru trails-and-errors while learning how to build container images, and make data persist for your application. But, it’s much faster and easier to rebuild images. This is one of a most to learn technology. In this post I’ll be covering how to install some needed components, how to commit the changes, and create a revised images for deployment. In recent event and meetings, I’ve been talking about how to work SQL Server Linux Containers Docker images. 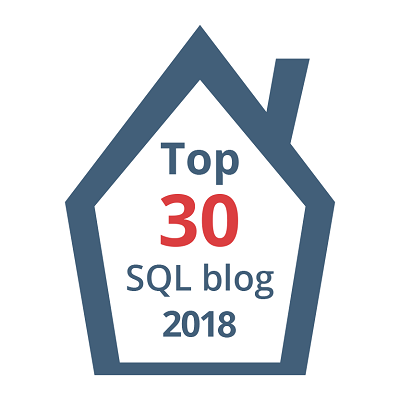 As these images get your container up-and-running quickly they lacks some tools that may be useful to complete the SQL Server configuration. The SQL Server images contains a small footprint of Linux Ubuntu 16.04 Operating System (OS) and is meant for quick deployment. The OS side the container need to be kept updated regularly. vim – for editing text files. ifconfig – to check your network interfaces. ping – to check IP-Address can be reachable across the network. curl – for transfering data. So, after you pull the docker image, create the container using “docker run …“, and then get to the container Bash session by using “docker exec -it …“. Remember the bash session only get you to the “root” level as there’s no users set on these containers. At this point make sure the active container status should be in “Up” status. Now can proceed to update the container. To have access to the container we use the “docker exec …” command. This command will allow to get access to the container “root” prompt. Notice if you try to execute: vim, ping, ifconfig, and curl are not installed in the container images. Also, it’s a good idea to create a Downloads folder in case to install other application(s). Notice that PowerShell Core Preview was included with the other missing components. PowerShell has become a great tool to have in a Linux environment. Although, this is optional but it doesn’t prevent you to include PowerShell Core Preview 6.2.0-RC1 with the SqlServer module which included the “Invoke-Sqlcmd” use by many administrator. This is a great module to have in a SQL Server container image. So, from the “root” prompt in the container open PowerShell Core Preview, then proceed to install the SqlServer module preview version 21.1.18095. This completes the essential for using PowerShell to help managing a SQL Server instance(s). 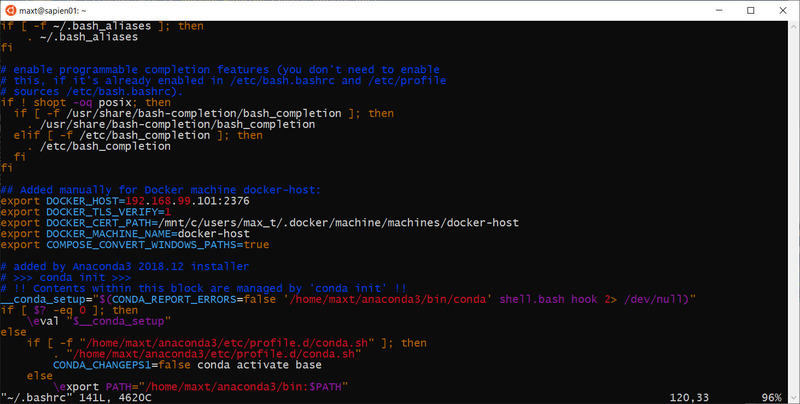 We could install the latest version of Anaconda with Python 3.7 in our SQL Server container image. This will give us the ability to test Python scripts within the container. This is a good indication that our *SQL Server container is active. And, now we got all missing components installed. Now, we need to make sure we don’t lose out changes. ## -> docker commit "<Get-Container_ID>" "<Image-name>":"<TAG name>"
The “docker commit …” command, you’ll provide both the image-name (all lowercase) and a TAG name (uppercase allowed). You can be creative in having an naming conversion for you images repositories. It’s very important to save images after doing the commit. I found out that having an active container would be useless without an image. As far as I know, I haven’t found a way to rebuild an image from an existing container if the image was previously removed. Hope this brief run down on working with SQL Server Docker container images will get you started with modifying existing images for quick deployment. One thing to keep in mind! The SQL Server Container memory need to be 4GB minimum. 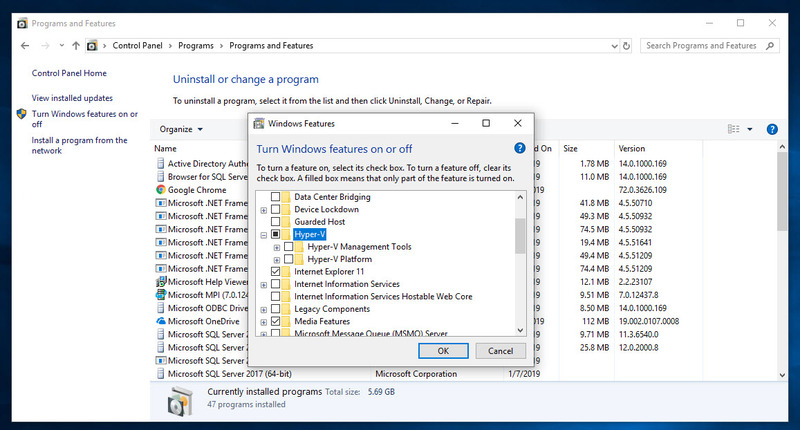 In Windows, if your’re using non-Hyper-V virtualization tools such as Virtualbox, the virtual machine memory need to be change to 4GB. Also, when you are creating images, the virtual machine disk size default is 20GB. This may need to be increase unless you keep cleaning/removing images to make room. Just layout what you need, commit, save and deploy your docker solution in your environment. Keep learning about this amazing technology! You all have been following Aaron Nelson blog post on Invoke-Sqlcmd availability Cross-Platform in the SqlServer module then you all are probably have proceeded to download the PowerShell SqlServer. At the same time, on March 5th, PowerShell Core 6.2.0-rc1 (Release Candidate) was made available for download. The thing is, in order to use the Invoke-SqlCmd cmdlet, you need to use PowerShell Preview version 6.2.0-rc1 (or greater). Now, SqlServer Module can be easily installed in all platforms but I found out that it won’t install in Windows 10 WSL Ubuntu 18.04. 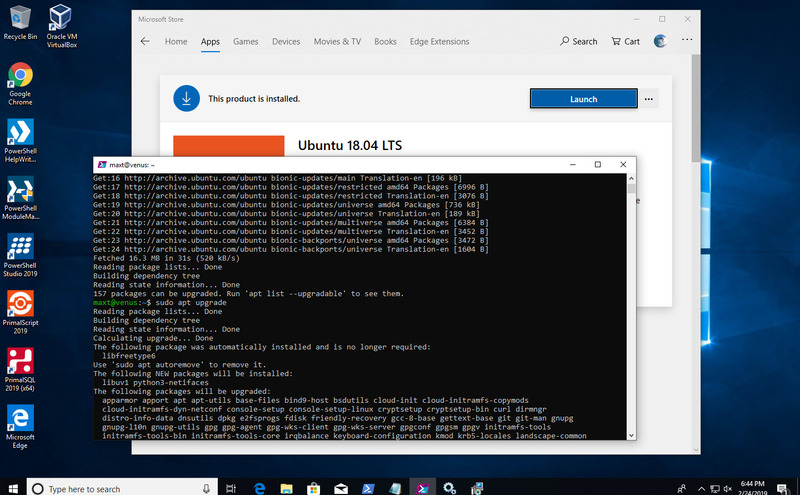 So, What the issue with Windows 10 WSL – Ubuntu 18.04? Normally, when working with modules in PowerShell Core, I always use the following Cmdlets: Uninstall-Module to remove the module and then Install-Module with the “-AllowPrerelease” parameter. This will work flawlessly, but I found out that it won’t installed it in WSL – Ubuntu 18.04. I don’t know why but it was installing the non-preview version SqlServer module 21.1.18080. So, the following PowerShell Core command line will force the installation of SqlServer module version 21.1.18095-Preview. 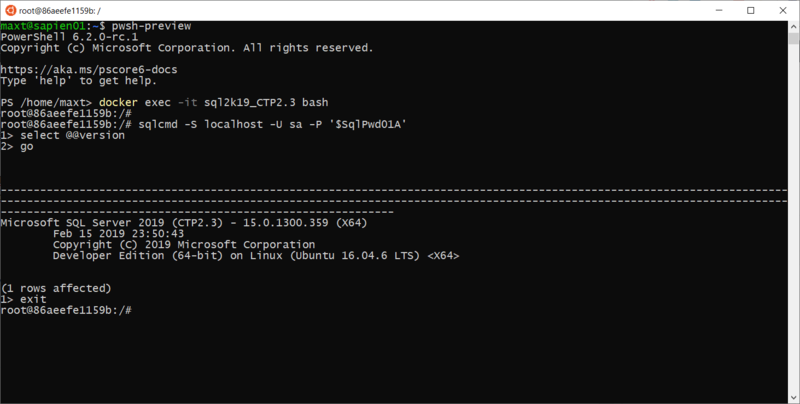 Now, we can start writing PowerShell Core SQL Server scripts in our Windows Subsystem for Linux – Ubuntu 18.04. The purpose of this blog post is to show how to setup Docker Community Edition in a Windows 10 with VMware Workstation to be use in Windows Subsystem for Windows (WSL). There are a few blog post that helped me figure out what’s needed to get this to work and I’ll be sharing these links at the end of this post. *Note: This is not the latest version of Virtualbox but it’s still supported. Remember, the purpose of this environment is to build a “developer sandbox” that can allow me to learn and work with Docker containers. 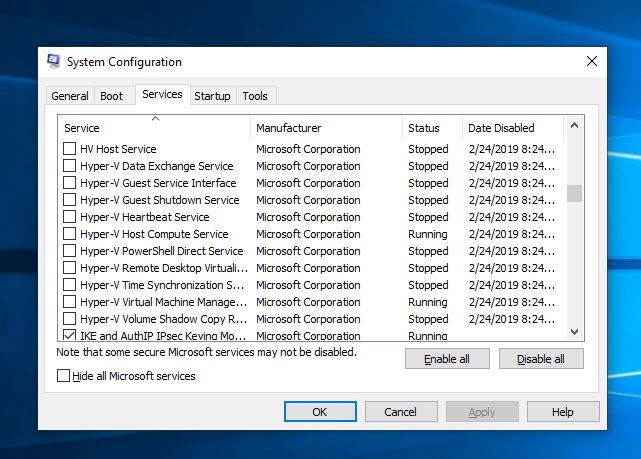 All Hyper-V services need to be disable by using “System Configuration” tool. Install from the Microsoft Store, WSL – Ubuntu 18.04. And, make sure to run “sudo apt update” and “sudo apt upgrade” because images are not updated with latest components. *Note: You’ll need to run these two commands manually to keep your Linux distribution up-to-date. At this point. make sure to reopen the WSL linux console. These commands should complete without any errors. 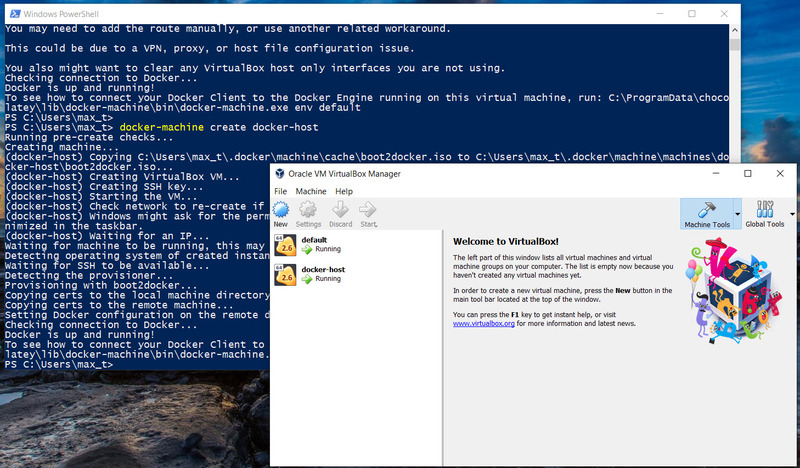 At the same time, two virtual machines: “default” and “docker-host” will be created and running in *Virtualbox. Next, execute the following command to write down “docker-host” environment results to be copied into the Linux user ~/.bashrc file. Reopen the “WSL – Ubuntu 18.04“ console. This command download (or pull) the Docker image, then run the Hello-World container. If everything work as expected, then it will display the following text. As you can see there no issues executing Docker command lines in Linux PowerShell Core. To see the full list of docker command line help available click on the following link. After all this is done! Docker working in my WSL environment. In my environment, I found limitations working with Docker Network using WSL which can impact Windows Docker-Machine VM “docker-host” interface. This issue can force you to rebuild both VM interfaces: “default” and “docker-host“. Make sure to learn how to commit, save, and reload Docker images. Don’t lose your changes! So, if you have either VMware Workstation and/or Oracle Virtualbox, consider investing the time creating a Linux virtual machine and then install Docker CE. 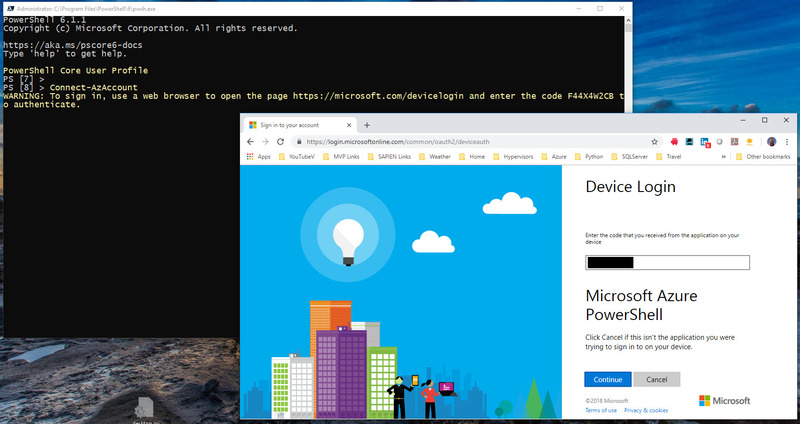 We have accomplished setting up Docker containers in *Windows 10 “WSL – Ubuntu 18.04” using both Windows PowerShell and PowerShell Core in Linux. So, using Oracle Virtualbox v5.2 with VMware Workstation is a required component to make this work. *Note: These post is meant for people to make Docker work in WSL Linux. 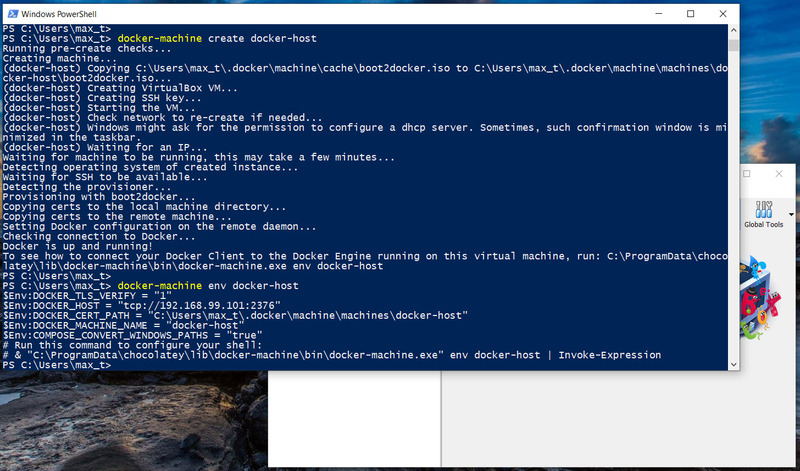 Also, if you’re familiar with PowerShell, Docker commands can execute without any issues. Now, I can use my favorite editor SAPIEN’s PowerShell Studio to build my automation scripts with docker commands. Try downloading other Docker images, like SQL Server 2017 and SQL Server 2019. This is the quickest way for providing a built solution using containers. Learn about Docker Compose, and Kubernetes as these can be use in the Cloud environment as well. Go and Explores the possibilities of provisioning solutions to your organization! Is it possible to have docker running inside of vmware? Sometime there’s the need to do PowerShell remoting from Linux to a Windows System. 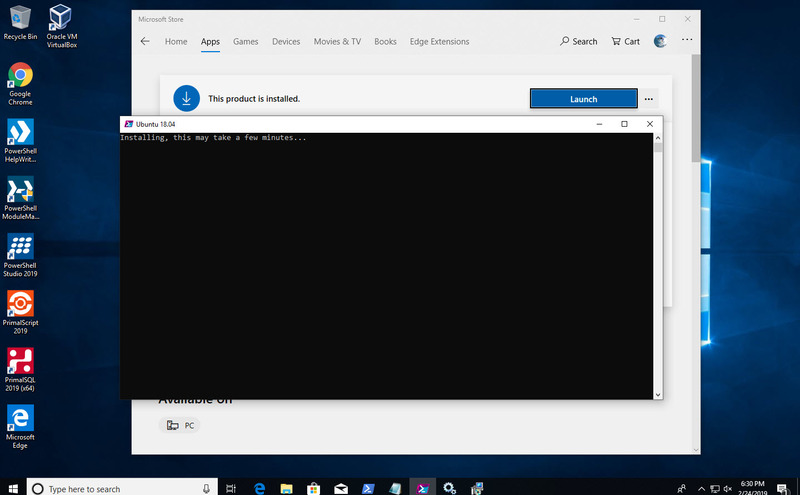 In my lab environment, I was able to install, configure, and established a PowerShell Remote connection from a Linux Ubuntu 18.04 system to *Active Directory joined Windows System. *Note: Before trying to following steps, if you’re in a corporate domain, consult with your security team. I would recommend that you try this scenario in virtual machine environment. I’ve been struggling trying to OpenSSH in both Windows 10 (Build 1803) and Windows Server 2019 with no success connecting from Linux. 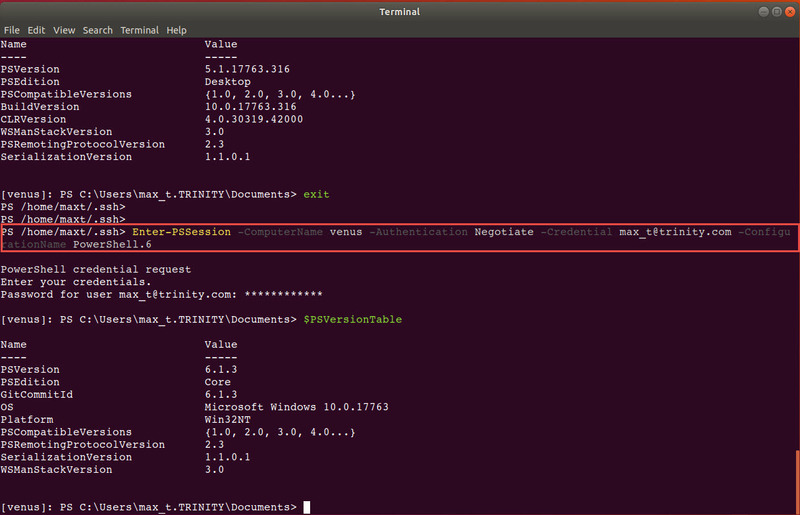 So, I decided to try install Kerberos component on my Ubuntu system and it works! And, with no need to joined my Linux system to my virtual Active Directory domain. *Note: Make a copy of the krb5.conf file before any changes. One thing to point out! Both DOMAINNAME and DOMAINMACHINENAME, must be in uppercase. Next step involves in configuring the ssh for Kerberos negotiation. This is the ssh_config file (not sshd_config). *Note: If there are missing ones, don’t touch the commented ones. Just copy/paste and set the values. After completing the changes, I would recommend a reboot. Here are a few linux commands to work with Kerberos client. If the krb5.conf setting are set correctly, then the following commands should work without any issues. 1. This command will verify user domain, asking for password. 2. Shows the list of Kerberos Cached tickets and credential. What about setting in Windows Systems? I’m will cover the whole PowerShell remoting setup. But, I will highlight what’s needed to make Linux connect to a Active Directory Domain system. In PowerShell Conscole, run the “Enable-PSRemoting -force” command line on both client and server. This command will add the firewall rule to allow PowerShell remoting to work. Check the Windows Remote Management service is running. 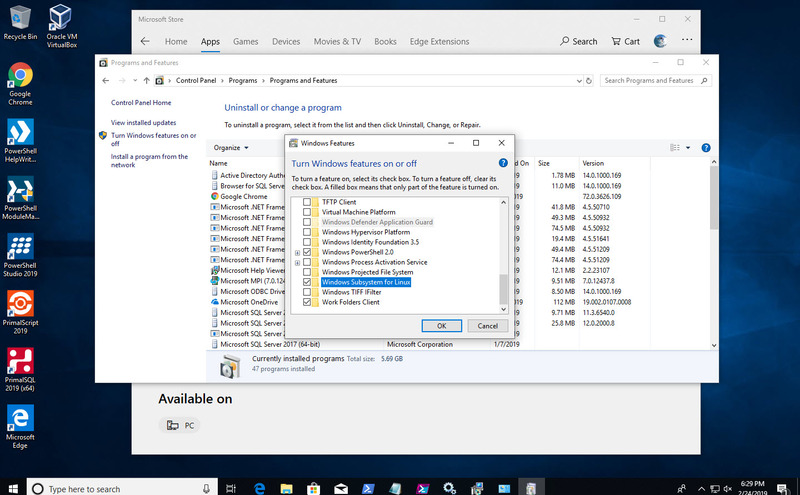 By default, in Windows 10 client, this is set to “Manual”. On the server, just verify that the service running. Before, connecting Linux to a windows domain system, make sure to test PowerShell remoting between Windows machines. This will guarantee that you got everything working correctly. Ubuntu 18.04 Connecting to a domain system final test. *Note: This remote connection will open Windows PowerShell and not PowerShell Core. 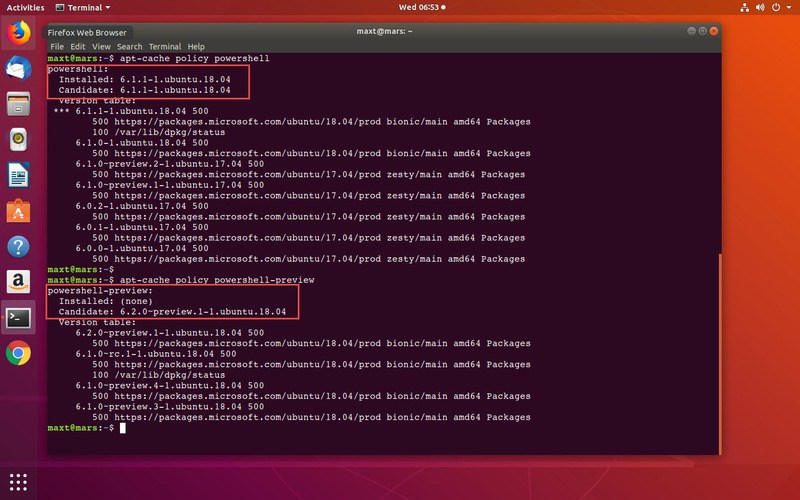 So, in Ubuntu 18.04 installing and configuring Kerberos user client only, you can connect your Linus system to a Active Directory Domain systems. But remember, this will connect to a Windows PowerShell session only. I’m hoping that in the near future we can have the ability to select a PowerShell versions. Wait!! There’s a way to open a PowerShell Core session instead of Windows PowerShell!! So, by default you’re going to connect to Windows PowerShell. But, if you use the following parameter ‘-ConfigurationName’ folllowed by either ‘PowerShell.6‘ or ‘PowerShell.6-Preview‘ then you’ll get PowerShell Core session. Also, you can use an specific version ‘PowerShell.6.1.0‘. Thanks to Steve Lee (Microsoft PowerShell Team) for letting me know this is already available. The following links help figured out the needed components to make my lab environment work. You all know how important is to have the tool that can make our life easy do our system administration, and become a hero in our organization. 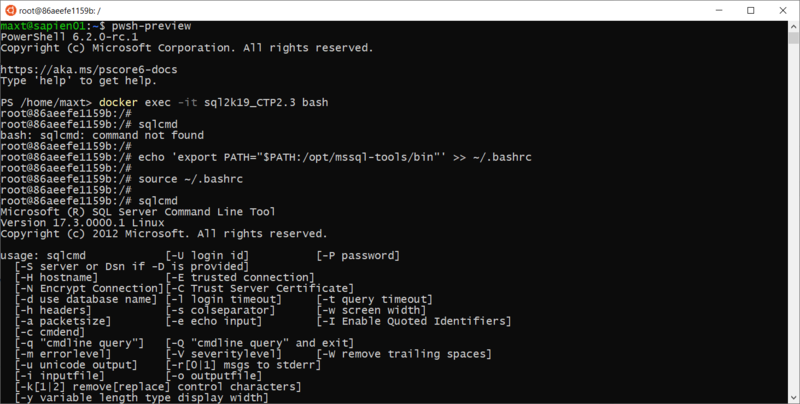 Here’s a startup helper guide to get you going with some PowerShell and SQL Server tools. What is available for automation! *SQLServer – This module currently can be use on SQL Server 2017 and greater. 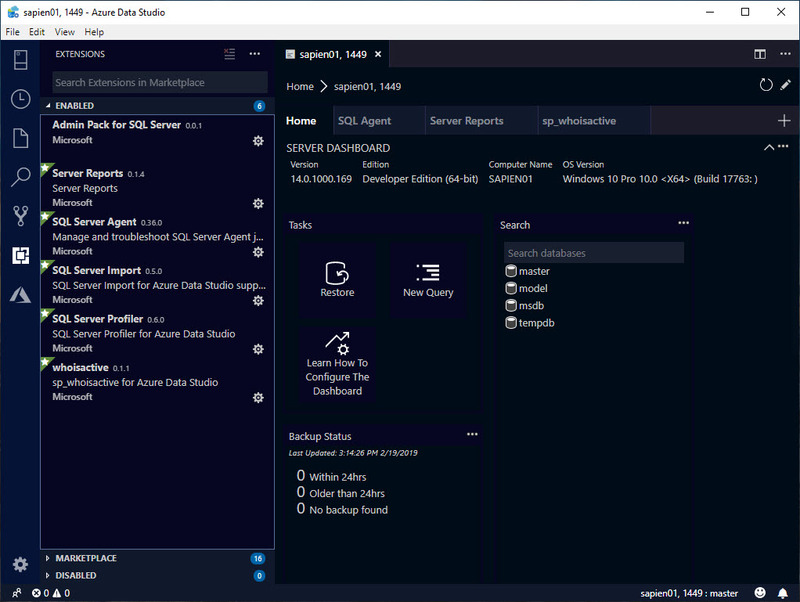 *DBATools – This a community supported module that will work with SQL Server 2000 and greater. 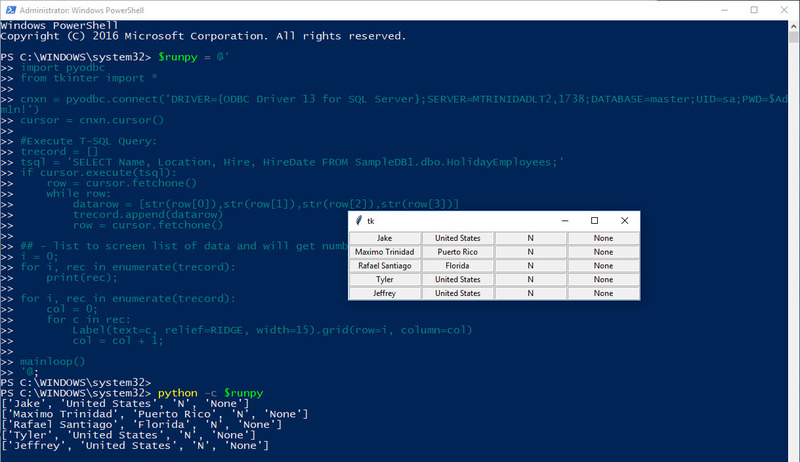 DBAReports – Supports for Windows SQL Server. DBCheck – Support for Windows SQL Server. All of the above module can be downloaded from the PowerShell Gallery from the PowerShell console using the Install-Module cmdlet. Now, when working with older versions of SQL Server (2008->2017), you will find the SQLPS module is loaded during the SQL Server installation. Just remember, since SQL Server 2017, Microsoft has change the PowerShell SQLPS module to SQLServer module downloadable from the PowerShell Gallery. This module is not available in PowerShell Gallery, only available during the SQL Server installation. When PowerShell SQL Server Module can’t provide a script? 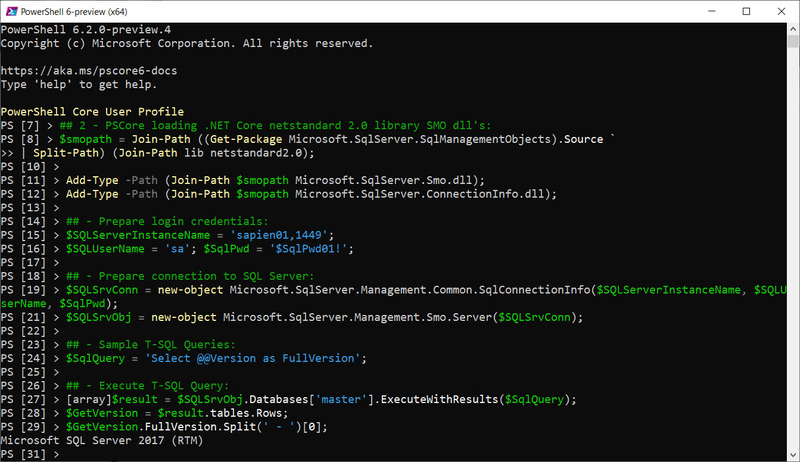 It won’t hurt to install the SQL Server Management Objects (SMO) library in case you want to be creative and start building your own SQL PowerShell scripts. This library is already available cross-platform, meaning that it will work in Windows, Linux and MacOS environments. 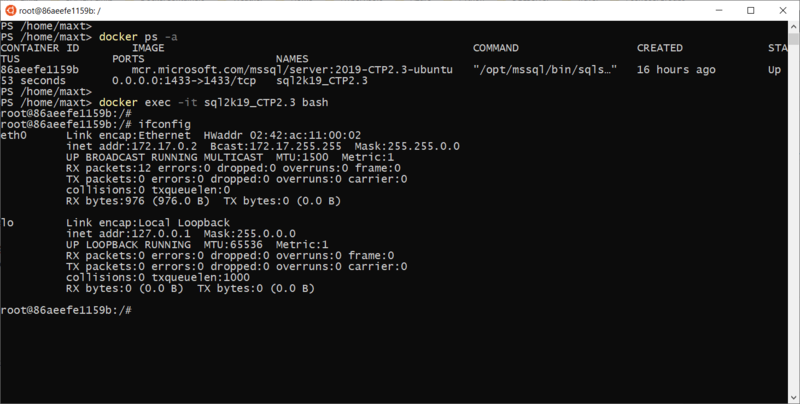 In this case, you can install the SQL Server SMO library “Microsoft.SqlServer.SqlManagementObjects” from the PowerShell Console using the Install-Package cmdlet. By now you should already know that Python has been around for many year as cross-platform interpreted object-oriented high-level language. And, its popularity keeps increasing. I would recommend to take a look at the Anaconda Distribution, and specifically the one with the latest version of Python (v3.7). This installation will include *All* Python packages available to build an application. 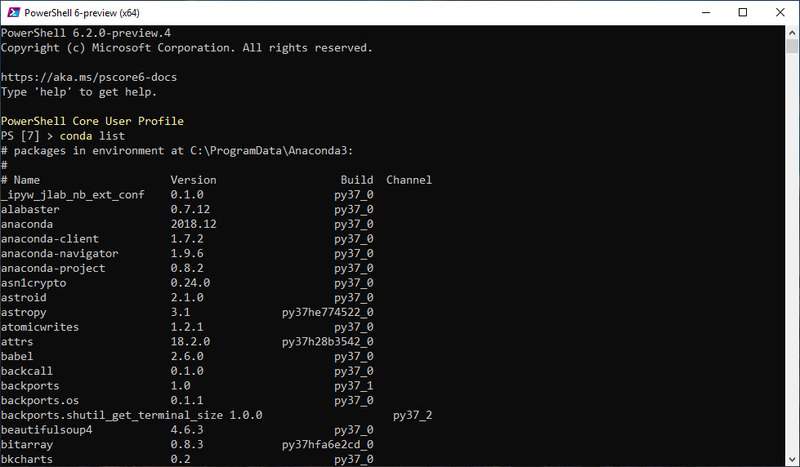 And, Python can interact with PowerShell too! Yes! Containers has become popular and can’t be ignored. 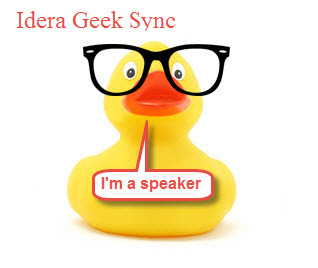 It can be use in both Windows, Linux and any cloud environments. Go ahead to learn how to work and manage Docker containers. Docker site to Download the Docker CE. Don’t forget to check Docker Hub to find the latest Docker Container images available for download. And, you will need to create an account before downloading images. The image below shows how-to search for the SQL Server image. As technology will keep improving, make sure stay up-to-date. This give us the opportunity to improve our job position and be of value for the organization that hire us. Don’t forget to look for the nearest technology event in your areas, as this is the opportunity to learn for free and gain invaluable knowledge. Containers have been popular for some time now in the industry. It’s becoming as important as learning PowerShell. Have you try it? While learning about Docker Container, I notice that is much easier to installed on a Linux system. In Windows, Hyper-V is a requirement to install Docker, and specially if you want to use the “Windows Subsystem in Linux” WSL feature, there’s more setup to complete. So, I’m not using Hyper-V, I’m using VMware Workstation. To keeping simple, I created an Ubuntu 18.04 VM using VMWare Workstation. You can find the Docker CE installation instructions in the following link. If you’re using Ubuntu 18.04. make sure to install Curl, as it isn’t included in the OS. After the Docker CE installation completes, make sure to run the “hello-world” to test the container runs. 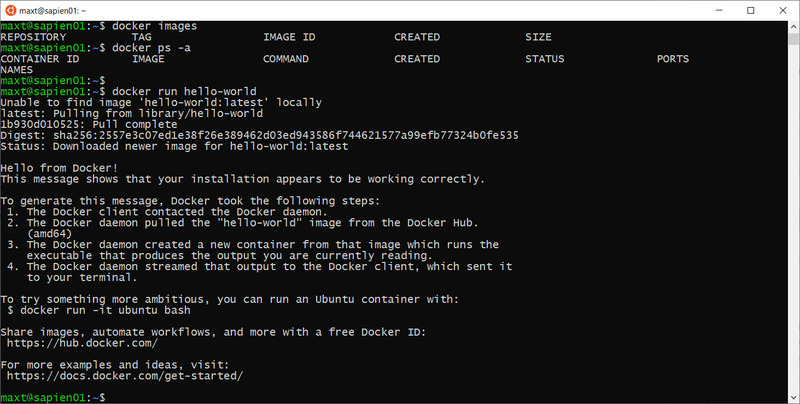 If you have Hyper-V and you’re interested in pursuing making Docker CE works in Windows 10 WSL (Windows Subsystem for Linux), check the following link on “running-docker-on-bash-on-windows“. Or, just go to the Github PowerShell page to get the latest version(s) for either GA (Generally Available) or the Preview. 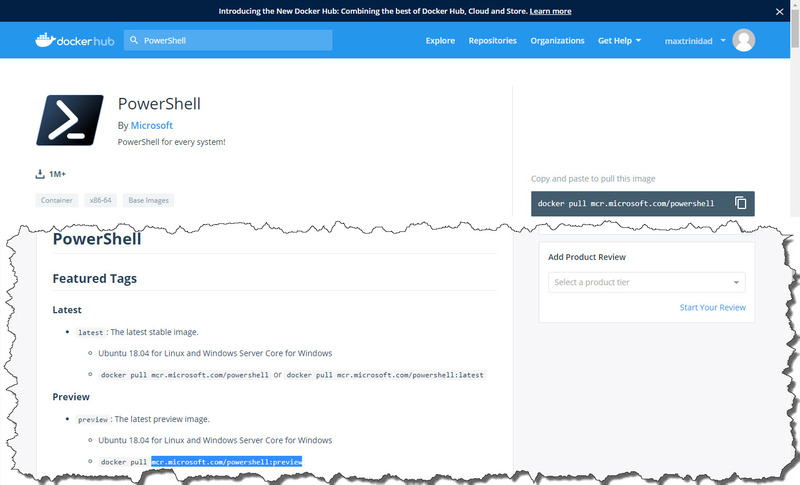 Then, open a PowerShell Core session to start working with Docker containers. If you want to find a particular image, then go to Docker Hub site. An account is required in order to login to the Docker Hub. In there you’ll find certified images that can download using the “docker pull <imagename>” command line. Interesting enough, while doing a search in Docker Hub, I found ta couple of PowerShell Core containers available that caught my attention. 1. PowerShell – Read documentation. Then execute the following command line to pull the container to your system. Note: It seems the Azure-PowerShell container is not currently up-to-date for both PowerShell Core GA and the Azure modules version. Just check for upcoming updates on these repositories later. As you can see, working with Docker containers and PowerShell makes it a convenient test environment. Either way, if you’re want to use Linux terminal session with or without PowerShell, there’s no reason why not to try it. So, after you have created the linux VM and complete the installation of Docker CE, you’ll get it working in minutes. Recently, Microsoft Azure team release the new version of the AzureRM Module can be install in both Windows PowerShell and PowerShell Core. Now, with the new version renamed from AzureRM to ‘Az‘, Microsoft is encouraging everyone to download and start using this refreshed module moving forward. Just make sure to keep reporting any issues on this module. Don’t forget to check out the recent blog about the Azure PowerShell ‘Az’ Module version 1.0. One of the most important fix was the issue experiencing with the TokenCache Initialization when using the cmdlet Import-AzContext. This issue was causing many DevOps to go back and use older version of the AzureRM module to get their script to work again. The “TokenCache initialization” issue was reported in Github for some time, and finally it has been fixed. Now, let’s take a look on how to connect to Azure. All of these cmdlets belongs to the “Az.Account” module which is included in the Az Module. Here’s where you can use find different ways to connect to Azure. There’s a total of 45 ‘Az‘ modules are installed in your system. First time connecting to your Azure subscription, you’ll use the “Connect-AzAccount” cmdlet. 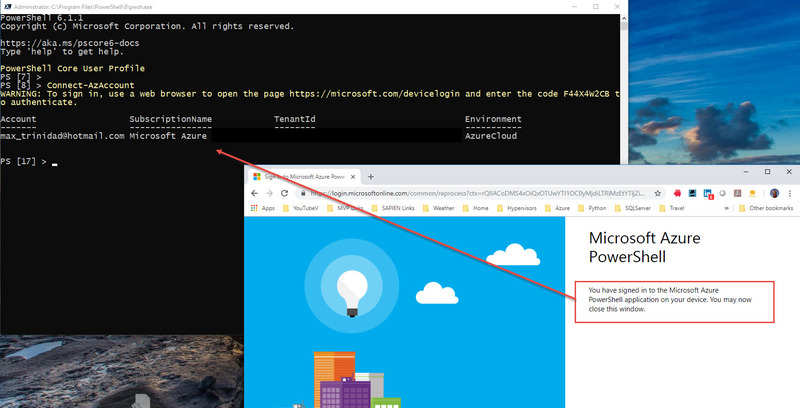 This cmdlet will asked you to open a browser, then copy/paste a URL and a code that will authorized your device to connect to azure. 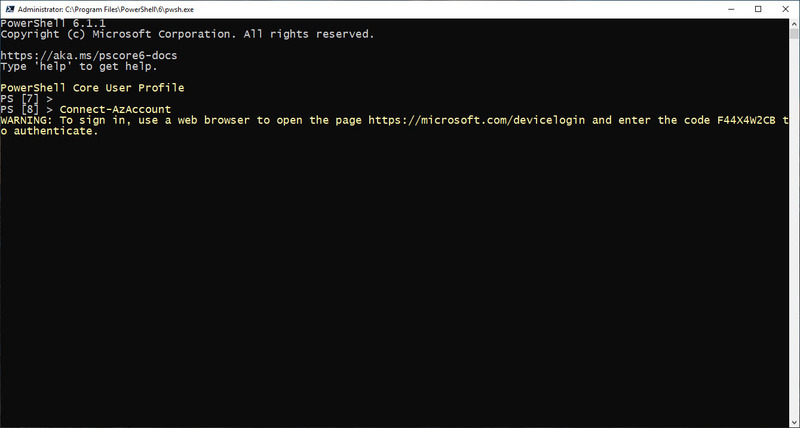 So, after the device has been authorized, you can start start working with Azure commands from any of the PowerShell Consoles. But, using the Connect-AzAccount cmdlet, the connection only last while your PowerShell session is active. So, as soon as you close the console, and you’ll have to repeat the whole process to connect to Azure again. We can reuse Azure Authentication in order to avoid the steps of re-opening the browser. Using the following cmdlets: Save-AzContext and Import-AzContext. These two cmdlets are very useful, as the Import-AzContext loads Azure authentication information from a JSON previously saved when using the Save-AzContext cmdlet. So, as soon as initially set the connection with the Connect-AzAccount and setup all the necessary configuration (resource groups, storage accounts, Availability Sets…), proceed to use the Save-AzContext to save the Azure Authentication information to a folder location of your choosing. Then, after exiting your PowerShell session, in order to reconnect again, just use the Import-AzContext cmdlet. I’m sure this one of the way many Azure DevOps are using the Import-AzContext to automate script in PowerShell. Just make sure to occasionally refresh the file as you’ll be making changes the Azure account(s) by adding/removing resources. Now, this has been available for awhile using the cmdlets: Enable-AzContextAutoSave, and Disable-AzContextAutoSave. So, if you want to stay connected to your Azure Account, every time you close and reopen a PowerShell Console, you can start working with Azure cmdlets without any delays. And, because you probably have been working with the Azure modules for some time, just execute the Enable-AzContextAutoSave cmdlet. Now, you can close and re-open PowerShell Console and immediately start working with Azure. This will make you feel like you are using the Cloud Shell on your desktop. Just remember, in order to disable this functionality, just run the Disable-AzContextAutoSave cmdlet and exit the PowerShell Console. As you can see, there are many ways to get connected from any system cross-platform to your Azure Account(s) to suit your need. This will work from anywhere from any system! Just go ahead, experiment and find your own way to work proactive with Azure. Just in case you haven’t try to install PowerShell Core Preview.3, in Windows, which became available on the evening of the 10th of December. 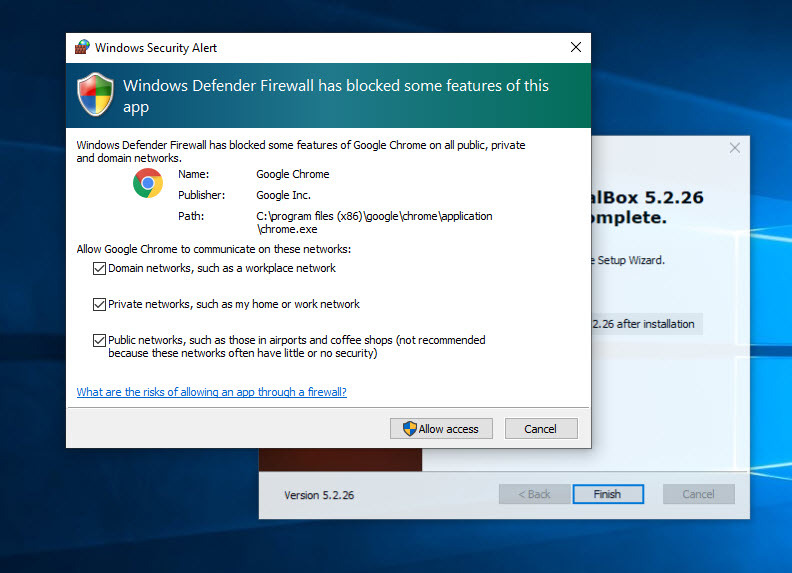 If are doing a clean installation, meaning that it was previously manually uninstall, or that this is your first installation, then you are fine. The issue with installing PowerShell Core Preview.3 is when you do an upgrade over a previous version: either Preview.1 or Preview.2. Simple! Although the installation will complete without any failures, PowerShell Core will fail to start. Using the Control Panel,”Add/Remove Programs”, uninstalling then reinstalling PowerShell Core. Or, run again the Preview.3 installation, but select “Repair”. Either options seems to fix the issue of PowerShell Core Preview.3 not to start. 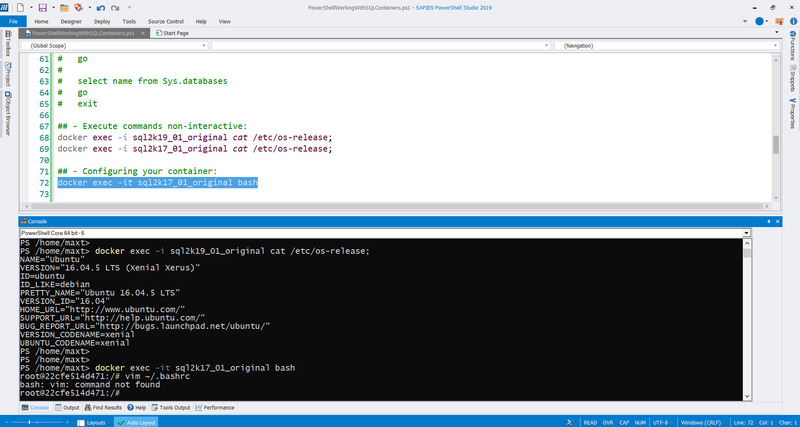 PowerShell Core Version 6.2.0 Preview.3 – Release Notes. This release includes the “Experimental Features”. Go ahead, try it! Be ahead of everyone with this new version. For more information about PowerShell Core Experimental Features, check the PowerShell-RFC0029 document. Please, any PowerShell Core issues can be reported in Github. I’m not sure who don’t get desperate to get the latest version of PowerShell Core when it becomes available. I do! Sometimes I’m lucky enough to check Github PowerShell repository to find out it has been recently out. But, this doesn’t means that is available in any of the other repositories! And, it may take a few more hours after it’s released. So, what would you do? 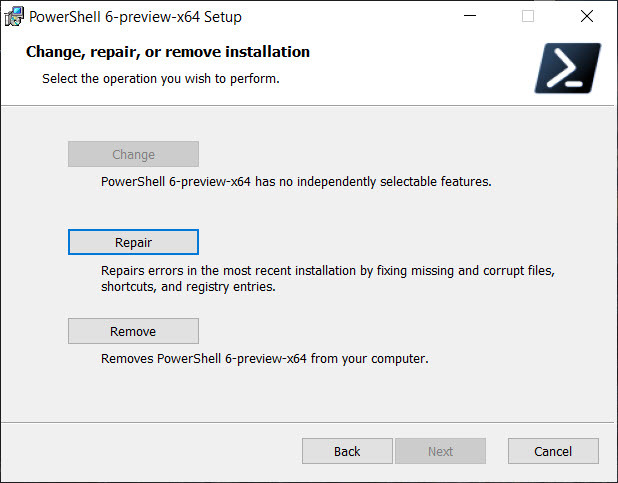 Let’s take a look at how to check for PowerShell latest version on different non-Windows Systems. ## - Display installed current information. ## - Seems when is current it will not display anything. MacOS Home Brew always takes longer for the new release to be available. So, if PowerShell Core isn’t available in the package repository, with a few steps you can download and install PowerShell. But, the first thing I do is to remove it before installing. ## - Before removing PowerShell - use Invoke-WebRequest cmdlet. Make sure, when in doubt, to check the package management documentation for any of the non-Windows Systems. Don’t forget to check the installation instruction for PowerShell Core installation in Github at this link.